Here is a peek at what the creative customers at Fat Quarter Shop have been up to. 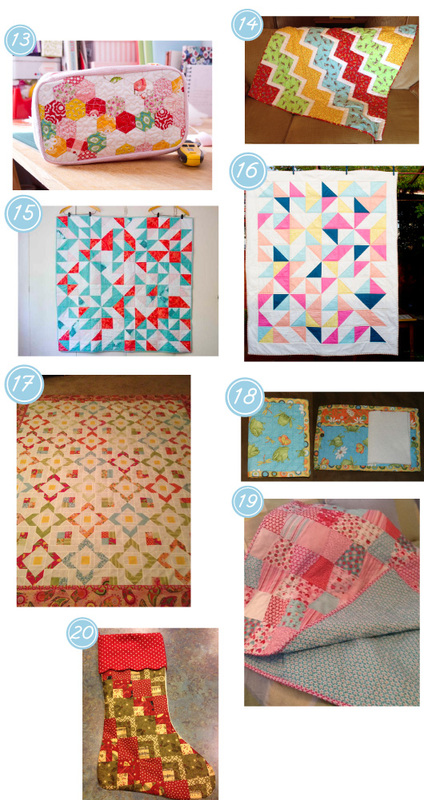 We love getting to see all of this quilty eye candy and hope you do too! Melissa's Brooklyn Bag by Clover and Violet using Tapestry by Fig Tree Quilts. Veronica's adorable doll quilt made with Ohh La La by Pillow & Maxfield for Michael Miller Fabrics. Debe from Canada made this adorable baby quilt for her Great Nephew in Spring Fever by Me and My Sister Designs. Kristine's Darla Quilt made using a Jelly Roll of Strawberry Fields by Fig Tree Quilts! Cheryl's quilt made using Cruiser Blvd by Sheri McCulley Studios! Shannon's first quilt made using Jingle Bell Snowmen by Stella Jean for Wilmington Prints! Drue's Dilly Dally Quilt using Marmalade by Bonnie and Camille! Jen's first quilt ever, made from a pattern from the Moda Bake Shop and Simply Color by V and Co! Julie made this adorable pillowcase for her daughter's friend at preschool using Illustration Ink's Superhero! Tammy's rag quilt/baby blanket made with Flannel Mischief by Nancy Halvorsen. Allison of Sew and Tell Quilts' knitting needle roll made with Simple Marks by Malka Dubrowsky. Veronica's second quilt made using Oh La La by Pillow & Maxfield for Michael Miller Fabrics! Noe's tote covered in hand stitched hexagons! Melissa's adorable Ziggy Baby quilt made with 5 Funky Monkeys by Erin Michael! Noe's Triangle Quilt made using half square triangles in solids and Prince Charming by Tula Pink. Noe's Triangle Quilt made using half square triangles in solids and stripes. Donna's Garden Jewels quilt made using Veranda by Amanda Murphy for Robert Kaufman Fabrics. Melissa's Needlebook made using Hip Hop Garden by Debbie Mumm for South Sea Imports. Deb's Tumbler Quilt made with Sweetcakes by Doodlebug Designs! Tammy's Christmas stocking made with Merry Medley by Sandy Gervais. Thank you for sharing your projects. Feel free to share on our Flickr Customer Gallery or email projects to chelsey[at]fatquartershop[dot]com.